Our friend Chris suggested hotdogs at the SF farmer’s market for lunch on Tuesday. He said they’re pricey, but really good. Okay, I’m always up for a hotdog, and everything at the Ferry Building is pricey anyway. But what I think he meant to say was, hey let’s go get some hot dogs at the farmer’s market, they’re addictive as crack and once you’ve had one, you’ll think of nothing else for days. Oh and it’s five bucks, but that’s a small price to pay compared to the taste festival that arrives in the crinkly tin foil they hand you. I think that’s what he meant to say. 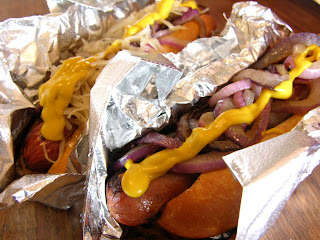 Prather Ranch dogs are made with organic beef from humanely raised cattle. The dogs are huge, grilled perfectly, with just a little bit of crunch on the outside, and the bun is thick and chewy and warm from the grill. They also have burgers and slaw. And slawburgers. And for an extra dollar you can get grilled red onions to top your dog, and that is a dollar well spent. You can find these delicious dogs on the grill on Tuesdays, Saturdays, and now Thursdays at the San Francisco farmer’s market outside of the Ferry Building. Be sure to check out their retail store inside. Thanks to Chris for the revelation. Can you send me a couple?